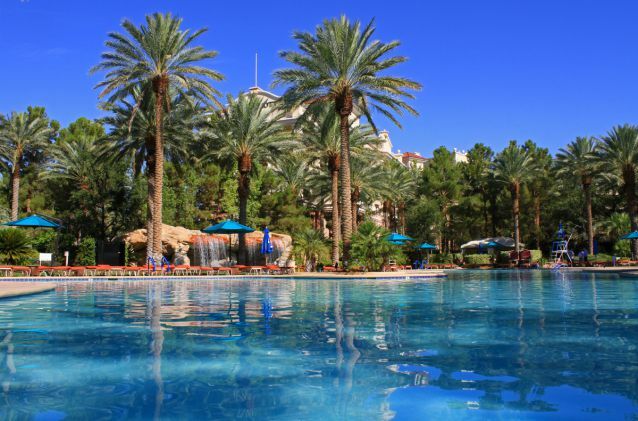 Tweet it: Take a dip at @JWMarriottLV’s pool this season! Resort offers pool membership, family passes & luxury cabanas. Las Vegas – March 6, 2015 – JW Marriott Las Vegas Resort & Spa is now offering access to its tropical pool oasis. This season, the resort offers memberships, family passes, delectable fare, specialty drinks and more. Guests may soak up the sun and relax in the serene 11,000-square-foot pool area surrounded by cascading waterfalls, palm trees, plush lounge chairs and views of the surrounding golf course and mountains.It’s an ideal location to host birthday parties and social gatherings, offering a special catering menu for any event booked in the cabanas. For a more exclusive experience, pool goers can reserve JW Marriott Las Vegas Resort & Spa’s private cabanas. Patrons may choose between Standard Cabanas, which can host up to eight people, or Grand Cabanas, which can accommodate up to 16. All cabanas have been upgraded to include the full spectrum of must-have relaxation amenities including flat-screen TVs, telephones, refrigerators, bottled water and safes for valuables. In addition, guests enjoy the convenience of fresh towels and personal cocktail service. Standard Cabanas are priced at $275 Monday –Thursday and $375 Friday – Sunday; rates are reduced to $125 for guests who spend $300 on food and beverage Monday – Thursday or $450 on food and beverage Friday – Sunday. Grand Cabanas are priced at $375 Monday –Thursday and $475 Friday – Sunday; rates are reduced to $150 for guests who spend $400 on food and beverage Monday – Thursday or $550 on food and beverage Friday – Sunday. Half Day Rates are available for day-of reservations only and are 50 percent off the regular price, available from 9 a.m. to 1 p.m. or 2 p.m. to close and based on availability. To celebrate the new pool season, the hotel is offering 20% off all cabana rates during the month of March. A perfect spot for a quick bite or refreshing libation, Waterside Café is a causal outdoor food and drink hotspot near the pool. Orders can be placed onsite or through the pool’s wait staff. The café offers the finest in classic poolside appetizers, sandwiches, salads and decadent ice cream or frozen yogurt bars for dessert. The café also mixes up summer-inspired Specialty Drinks ($12; 32-ounce Fun Cups are $23 with $17 refills), Frozen Drinks ($12; 32-ounce Fun Cups are $23 with $17 refills) and Shots ($10), and offers beer drafts ($5.50), pitchers ($14) and an 80-ounce Mega Beer Tower ($23). Signature drinks include Waterside Splash, a fruity mix of Smirnoff Orange, Smirnoff Watermelon and pink lemonade with a splash of Sierra Mist; Geisha Girl, a swirl of Absolut Mandarin, Aperol and fresh-squeezed lemon juice topped off with blood orange syrup; Island Paradise, Malibu Caribbean Rum and Myers’s Rum blended into a mango and strawberry puree; Sapphire, a concoction featuring Bombay Sapphire gin and St. Germain Elderflower Liqueur mixed with cranberry juice and Red Bull; and many more. Guests must be 21 years of age or older to order alcoholic beverages. Fans of the resort’s luxurious aquatic haven can enroll in memberships or purchase passes for the whole family. Individual Memberships are priced at $150 per month or $495 for the entire season. A Family Pass is $250 per month or $795 for the entire season; offers are available for two adults with up to three children or one adult with up to four children. Along with a full summer of fun, members receive additional benefits including discounted cabana rates and 10 percent off at Waterside Café. JW Marriott Las Vegas Resort & Spa’s pool area is open for members and hotel guests from 10 a.m. to 5 p.m. daily. Non-members and non-hotel guests can enjoy the pool Monday – Friday, excluding holidays and blackout dates, with a cover charge. Day pass admission for non-hotel guests is priced at $8 for children between the ages of 6-15 and $15 for all patrons over the age of 16. Children under 15 years of age must be accompanied by an adult with a maximum of three children per adult. Memberships and one-day admission can be purchased at the Pool Towel Hut, located at the pool’s entrance gate. For more information on JW Marriott Las Vegas Resort & Spa’s pool amenities and offers, please visit www.marriott.com/LASJW or call 702.869.7777.